In 2009, Mark Webb directed one of the best indies of that year, (500) Days of Summer. Quirky and endearing, it was a success both with critics and audiences. It also set Webb on the path most successful white male independent filmmakers find themselves on following such a hit: he was drafted to helm a superhero movie. Specifically, 2012’s Amazing Spider-Man and its 2014 sequel. Evans makes it easy to forget that other blockbuster role, as he delivers a solid, sincere performance as Frank, a single guy who repairs boats for a living while raising his young niece, Mary, after his math-genius sister took her own life just after the baby was born. He may just be the best thing about the film, a pleasant surprise for someone like me who wasn’t sure what to make of the actor behind the shield. Mary is, of course, the gifted one in this scenario, inheriting her mother’s (and we learn, the rest of her family’s) talent for numbers and equations. Webb’s sweet if sometimes cheesy drama from Tom Flynn’s script begins as seven-year-old Mary sets off for school for the first time, previously homeschooled by her uncle and their landlord-slash-surrogate-mother-figure Roberta (Octavia Spencer, who, can we all just agree, should be in every movie ever?). It’s at this crossroads that Mary and Frank’s easy if unconventional life together begins to unravel, as Mary’s teacher Bonnie (an only slightly-too-goofy Jenny Slate) recognizes both the girl’s skill and her behavioral issues. Mary struggles to fit in with her classmates, defends a bullied boy to the tune of breaking the bully’s nose, and can’t seem to keep her mouth shut when she should, all while breezing through her class work and doing complicated math problems in her head. Cue the frigid British grandmother (why is she British?) swooping into town to put Mary back on the right track. Mrs. Adler, of course, is the misunderstood matriarch who pushed her own daughter to pursue mathematical glory and finds Frank a disappointment in every way (and doesn’t fail to tell him so). And thus, the film’s main plot line is set in motion: a custody battle where the idea of “what’s best for the child” depends on your definition of “best.” Should a kid get to be a kid, or should a prodigy be helped along to her full potential? Flynn’s script is sharp and moves at a solid pace; we’re certainly never bored as we bounce from Frank’s small but cozy home to the bar where he lets off steam to the classroom to the courtroom and back again. The movie weaves together a cast of characters that all bring something different, if archetypal, to the screen. Frank is the strong, silent type with a soft heart; Mary is quick-witted and adorable; Bonnie is well-meaning and just flirty enough; Mrs. Adler is, well, British. And yet, the storyline is such that, for those who’d like to, it’s possible to see around pretty much every bend in the road before it’s even ahead of us. The original script (that is, it doesn’t appear to be based off any book or other work) offers poignant moments, to be sure. When Mary asks Frank whether God exists, their exchange, driven largely by Frank’s honest, intelligent answer is quite touching. With a less-skilled cast, it’s a moment that could’ve easily slipped off-key. Instead, Evans, Slate, Spencer and crew are so good at what they do, they manage to collectively hold up a scattered plot like someone chasing after a dropped bag of marbles. Lines that are essentially pointless (Spencer actually has to say at one point, “I’m so worried…“) are delivered with enough nuance to be forgiven. Scenes that plug in to keep the plot skipping ahead are presented with commitment, superfluous as the exchanges might be. As the stakes get ever higher in the custody battle over Mary, the story becomes a bit too unwieldy even for these pros. There’s a scene at MIT complete with complicated equations on rolling chalkboards, talk of greatness and going down in history…it all starts to feel a bit too much like a poor man’s Good Will Hunting, except this time with a scrappy first-grader. As the film reaches its (perhaps overly) heartfelt conclusion, I’d be lying if I said I didn’t appreciate just a bit the way it all gets wrapped up in a bow, the lessons tidily learned and relationships smoothly restored. 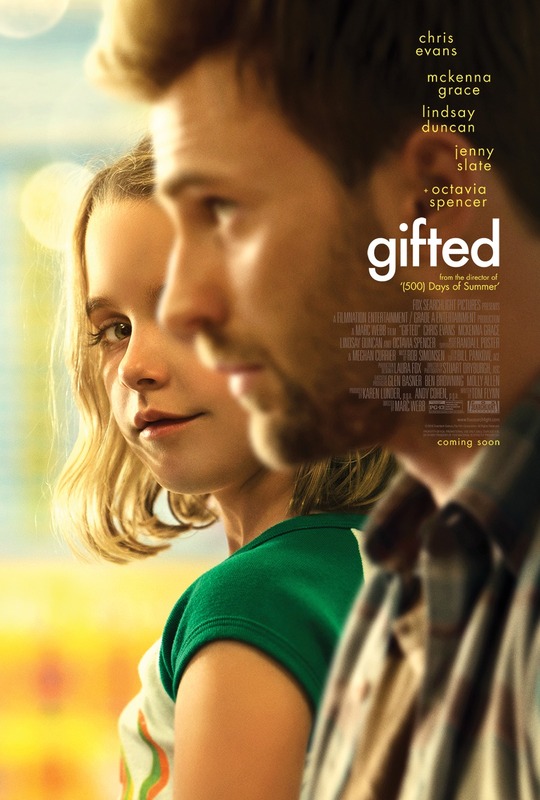 Gifted is not going to top anyone’s Best Of lists at the end of the year (certainly not mine), and (500) Days of Summer remains Webb’s stronger film. But this well-meaning, family-friendly fare should nevertheless do just fine with the movie-going set who enjoy their popcorn with a pinch of happily-ever-after. And where’s the harm in that?